In 2017, ZEN BOX will be sent every other month, with the first boxes shipping February. Registration opens January 1st, with a special 28% off discount for the annual one-time payment at Sublime Naturals and other bonuses at sign up. ZEN BOX, a bi-monthly subscription box of essential oils, is now open for registration - with bonuses! 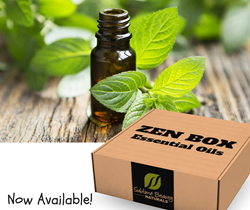 ZEN BOX, an exciting subscription box of essential oils, has made changes for 2017 and is now open for subscription and purchase. The first 20 new members get a free bottle of ZEN AIR IMMUNE BOOST, a diffuser blend of essential oils for wellness, plus a ZEN BOX folder to hold the profiles and education. "Our ZEN BOX now includes a number of benefits we didn't have in 2016," says Kathy Heshelow, founder of Sublime Naturals and ZEN BOX. "It is now a bi-monthly box (every other month). We are able to offer VIP points for each recharge to be used for essential oils, accessories, carrier oils, diffusers, etc. And we are starting a new Podcast in February, plus 35%-40% off promos in the 'no box' month." ZEN BOX members are still able to control their account (to pause, cancel, update a card or address); they get Free Shipping in the US, and get bonuses twice yearly. The Educational Profile & How To Use Guide continues as well, emailed when the box ships. Sign up here now, at Sublime Naturals. Choose either bi-monthly payment or a one-time annual payment (to save 28% or just $32.40 per box). "The education - How to use the essential oils, what they do, which are good for what, anecdotes, history, medical & scientific research - this often proves to be one of the favorite bonuses with ZEN BOX for subscribers," says Heshelow. Sublime Naturals essential oils are therapeutic-grade quality. Heshelow, author of "Essential Oils Have Super Powers," is a big fan of the strength of essential oils for wellness and joy. "Many don't know that essential oils can and do kill bacteria and viruses, and so much more," says Heshelow. Subscribe today and start the fun as well as a healthy 2017.